Like the original GP (General Purpose) “Jeep” of WWII, the modern equivalent, the High Mobility Multipurpose Wheeled Vehicle (HMMWV or Humvee®) will go down in history as one of the most successful, widely used military vehicles of all time. After a successful bid by AMC (American Motors Corp) in 1981, the US Government awarded an initial contract for 55,000 units and the rest is, as they say, history. Some 200,000 vehicles are now in use by more than 50 nations’ armed forces, paramilitaries and civilian defence units. With their high profile success in military operations such as ‘Desert Storm’ during the 1990s, there was a predictable demand for a civilian version and the H1 was conceived. Based on the original Humvee platform, you won’t get ballistic protection as standard, nor will “machine gun turret’ appear on your option list. The H1 was discontinued in 2006. 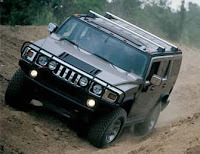 AM General sold the ‘Hummer’ brandname to GM in 1999 and began producing the H2 based on existing commercial truck chassis platforms with only external similarity to the original Humvee. Engines are 6 litre petrol V8s compared to most H1s being fitted with 6+ litre V8 diesels. Introduced in 2006 and powered by a 3.7 litre, five cylinder petrol engine producing 180kW and 328 Nm, the H3 shares its platform with GM stablemates, Colorado and Canyon. In Australia, the H3 is available in both manual and automatic transmission connected to a two-speed, electronically-controlled, full-time 4WD system with both stability and traction control. Sold as a mid-size SUV the interior, including luggage space is constrained and a bit difficult to pack a full holiday. Two passengers can fold the rear seat for added capacity. The H3’s road manners are surprisingly good, delivering a smooth, confident ride and easy steering. Off road, the little H3 is a proper 4WD and made easy work of the tasks we threw at it. Shallow river fording, rocky and slippery exits, bumps, humps and trenches were all consumed with ease. Decent underbody clearance (216mm) with limited front and rear overhang meant we never scraped anything. Even if you want to extend the H3’s capabilities, an optional Adventure pack is available, adding $6k to the pricetag. The petrol engine is adequate but not startling and is rated at 13.5 litres/100km for the auto transmission and slightly less for the manual. Payload is about 430kg and towing with the automatic transmission is a generous 2 tonnes. Fuel tank capacity is 87 litres. A turbo diesel variant is being discussed and would be welcome addition to the range. The base model H3 sells for $52,990 up to $60,990 for full specification luxury and is sold through 21 dedicated dealers nationwide. See: www.hummeraustralia.com.au. 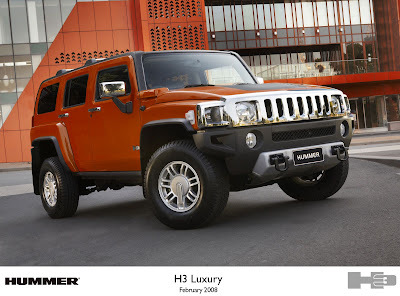 Stop Press: At time of writing, General Motors was still reviewing its options for the Hummer brand which could include outright sale or closure. Apparently interest has been shown by automakers in India, China and Russia with India’s Mahindra the most likely contender.